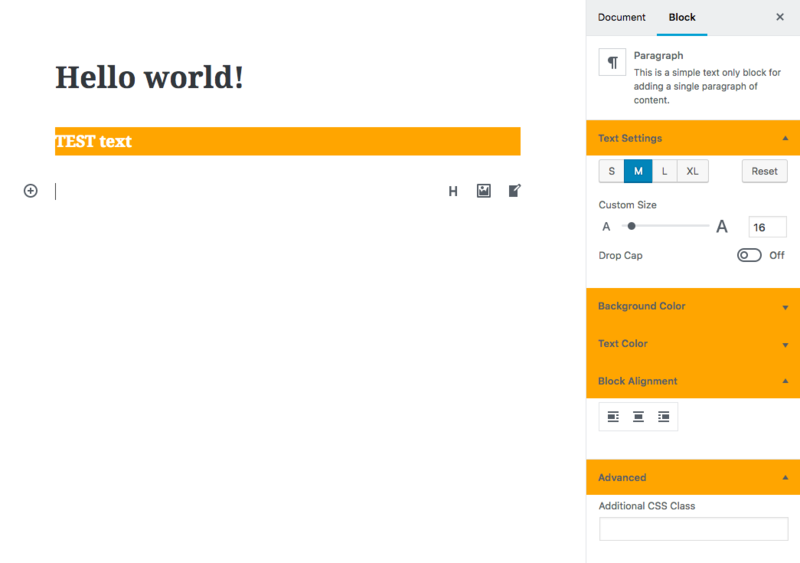 This is the third part of a WordPress Gutenberg Blocks series. You can see Part 1 and part 2. The finished repo for this tutorial is located here. We’ve created a simple block that allows a user to edit an h2 element in a truly WYSIWYG style. We’ve talked about how WordPress Gutenberg does attributes and how that enables us to create interactive elements. And keep in mind that the way I think about it is partially a matter of preference and there are many grey areas. I have heard on many occasions, though that stuff in the theme are for presentation, stuff in a plugin are for functionality. Editor.css and view.css are in the plugin, so technically they should be solely for functionality… (shrug). Now you should see those styles in the editor and the view. But yet again, there’s another problem! We are affecting things outside of our block because our CSS is not targeting our block class. So let’s talk about how to handle classes in our Gutenberg Block markup. Now, we should see the styles being only applied to our block. Sweet, sweet victory. className // The class name as a string! One thing is different now, though. If you load up the block in the editor again, you will have an orange background but black text. If you update, you will have an orange background and white text. The reason for this is that you aren’t targeting the h2 color specifically, and the Gutenberg editor has styles that color headings black. The stylesheet we just added will always be used in the editor and in the view. Sometimes, though, there will be elements that are used in the editor only that need to be styled. So how to we enqueue those stylesheets? It is important to name wp_enqueue_style differently (in our case ‘hello-world-editor-style’) to make sure there aren’t conflicts in enqueuing. Also, be careful to change the dependency from ‘wp-blocks’ to ‘wp-edit-blocks’. So when is this useful? I’ve used it a couple times where elements I created elments that only appear in the editor. For example, when I created a gallery, I had buttons that allowed the editor to move images left/right or remove them. These buttons need some sort of love and styling, but only occur in the editor. We’ve gone over how to enqueue view and editor stylesheets. We also used the className prop to manually place classNames within our blocks. Next up we need to look at RichText more in depth and include InspectorControls and an editing Toolbar. Thank you very much for these tutorials … There is not much on this theme. I did part 1, 2 and 3. I will continue with part 4 and 5.